From old wives’ tales to well-meaning advice from friends, or home remedies and natural treatments that claim to be better than over-the-counter products. To truly banish those pesky blemishes, you'll need to distinguish the difference between the fact and fiction. That's where we come in. This week, we are going to clear up any tested truths. The Reality – Teens aren’t the only ones who break out. In fact, 40-55% of adults between the age of 20 to 40* suffer from adult acne. It’s more common in women because of our hormones – although some guys get it as well! So, if you are one of us with acne it’s super important that you follow a skincare regime that includes cleansing, treating and moisturising. The Proactiv+ 3 Step kit has everything you need to help manage adult acne, plus it has great skincare benefits too. The Reality – This can work, but only as short-term fix. The ice freezes the blood vessels, making the pimple appear less red and less swollen. But it’s just temporary, sorry girls! You don’t want to over-ice as well, because it can inflame other conditions like rosacea. You are better off cleansing and moisturising (and popping a little concealer on). The Reality – Absolutely false! There are two types of exfoliators - one uses beads to remove dead skin cells from the skin’s surface whilst the other contains glycolic acid and salicylic acid to help dead skin cells to shed chemically. Like all Proactiv+ products, the Skin Smoothing Exfoliator does the duty to allow your skin to shine. It contains 2.5% benzoyl peroxide to clear away blemishes and help prevent future breakouts. The Reality – Everyone is born with natural face oils and if you wash your face too often you may be making your acne worse. Over scrubbing can lead to irritation, even tiny scratches or micro-tears in the skin, which can lead to more infections and inflammation. The Reality – Don’t! We absolutely hate this myth. If toothpaste is made for teeth why would you be putting something like that on your delicate skin? Even though dental products are drying agents that contain benzoyl peroxide and salicylic acid, they are way too harsh for your skin. 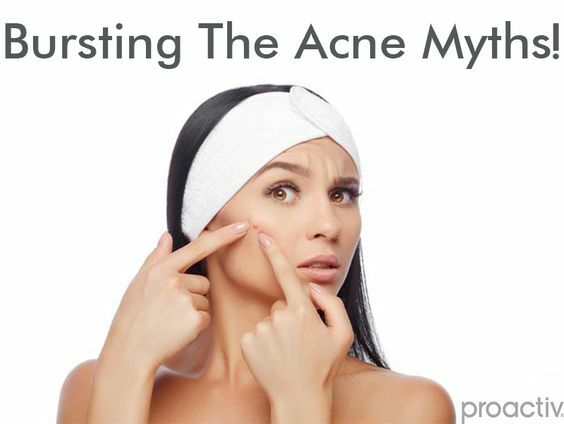 If you have tried toothpaste on your spots, you may have noticed it worked temporarily, however acne spot treatments (that are designed to be used on the skin) like the Proactiv+ 3 step Kit are milder and much more soothing for your skin. Save the toothpaste for your teeth and save your skin! We hope we have cleared up some of the rumours you have heard about acne. Next week we are going to talk about different exercises to destress your life!